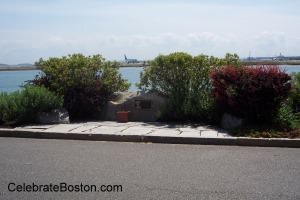 On October 2, 1954, a Massachusetts Air National Guard F94 Starfire experienced engine failure and crashed near Logan Airport. 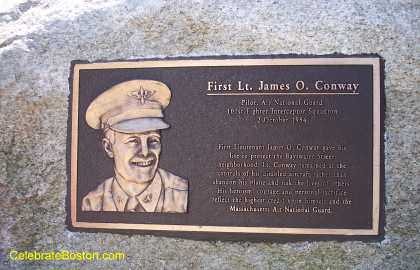 Its pilot, First Lieutenant James O. Conway sacrificed his life by veering the plane into an embankment on Bayswater Street in East Boston. Conway could have easily bailed out from the aircraft and saved his own life, but the plane would have crashed into a nearby neighborhood and caused great destruction. Lt. Conway was taking off from Logan in response to a report of an unknown aircraft. It was the height of the Cold War in 1954, and planes scrambled often due to the Soviet threat. The F94 was loaded with fuel and ammunition. If the plane had crashed into the adjacent neighborhood, a large inferno would have ensued, as most of the houses are constructed of wood and are not far apart from each other. A Bayswater resident who was 10 years old at the time described the aftermath of the crash to this author. Conway had deliberately veered the plane into the embankment that abuts Bayswater Street. It was high tide, and the aircraft skimmed on the water just before crashing. It erupted into a ball of flame on impact, with the ammunition and fuel exploding. Some of the ammunition and debris fired across the street and set a home on fire. There were fortunately no injuries to bystanders as a result of the crash, with the fire quickly put out. The plane was described as a "crumpled heap" in a contemporary newspaper account after the fire was extinguished. abandon his plane and risk the lives of others. The memorial was dedicated in 2004, 50 years to the date after the accident. In a boston.com article about its dedication, James Conway's widow, Mary, spoke of her late husband: "He was handsome, fair, funny, intelligent; that's why he didn't live long. He was too good for this earth," she said, adding, "I never remarried. My heart has been broken ever since."